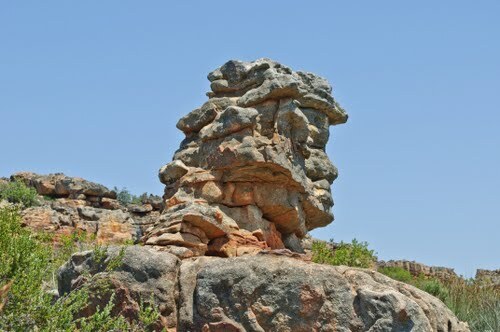 Soldaatkop is a rock formation on a back road of the R364. The formation can only be seen when travelling back towards Clanwilliam. One is recommended to first visit the grave of C.L. Leipoldt and on the return journey to Clanwilliam, about 1,5 km from the grave take the gravel road on the left, this road is not suitable for normal cars, leave it at the beginning of the gravel road and continue by foot, walk for a few minutes, the monument is marked with a sign on the left hand side of the road.